Like the song says, “Baby, it’s COLD outside”! 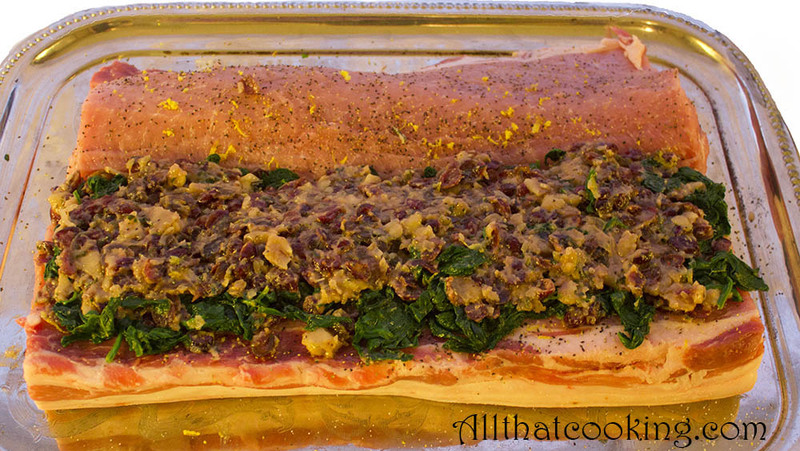 Why not heat up the kitchen with the warm winter time aromatics of a sage stuffed pork loin? This is a typical winter dish in Scandinavia especially in Denmark where they are famous for their quality of pork. Ask your butcher to butterfly a skin on pork loin and you are set to go. Add some fresh sage, dried cranberries and just a few other items to your shopping basket. Before you head home out of the cold you might consider tossing a small pineapple into that basket. 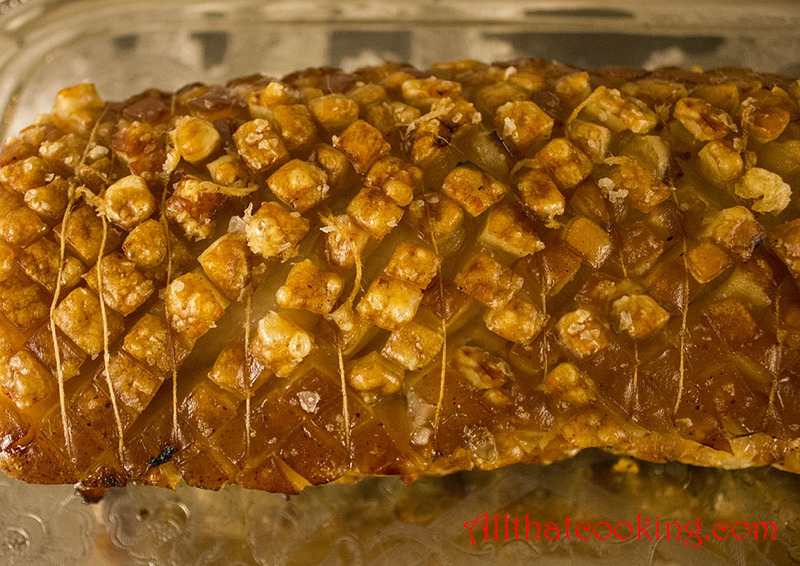 Caramelized pineapple makes a just right sweet counter point to the savory pork loin. So here’s a little extra recipe that’s quick and just sweet enough. Simply cut off the pineapple top. Cut away the outer husk deep enough to remove the “eyes”. Place pineapple on its side and slice into rings. Cut rings into 4 and use a small sharp knife to remove the tough core from each piece. Sprinkle both sides of pineapple slices with a little sugar. Melt 1 tablespoon of butter in a medium size frying pan over medium high heat. Add a few pineapple slices. Cook and stir pineapple until browned. Flip slices and brown the other side. Continue with butter and remaining pineapple slices. 1. In a medium size bowl soak bread cubes in cream. 2. Heat two tablespoons of the olive oil in a medium pot over medium heat. Add onions; cook and stir until translucent. 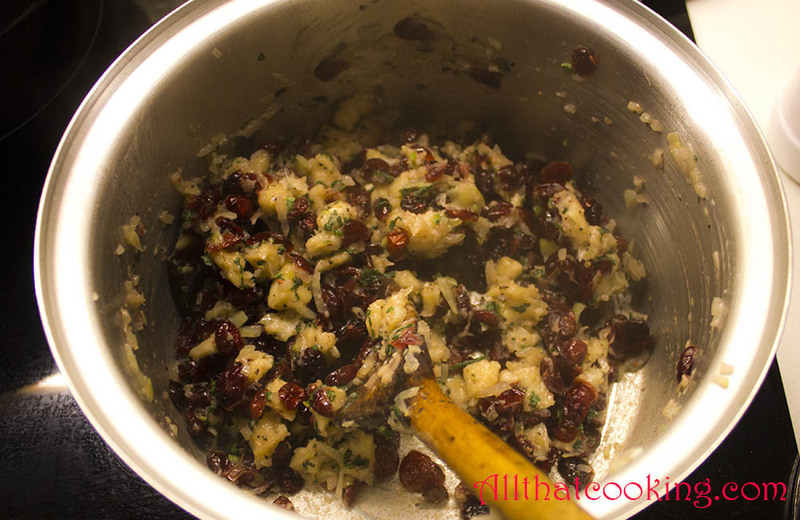 Gently mix bread, cranberries, sage, and chicken stock into onions. Reduce heat to medium low and stir constantly until all liquid has evaporated. Season to taste with salt and pepper. 3. Remove pot from heat and allow stuffing to cool for 10 minutes. 4. Stir egg into stuffing mixture. 1. Heat another two tablespoons of the oil in a large frying pan over medium heat. Add spinach. Cook and stir until leaves are wilted but still a deep green. Season to taste with salt and pepper. 1. Spread butterflied pork so that it lies flat. Sprinkle interior with lemon zest, salt and pepper. 2. Evenly spread a thin layer of bread stuffing over bottom half of pork. Now evenly spread spinach over this. Top with remaining bread stuffing. 3. Bring top portion of pork over the stuffing and roll up tightly. Take a small sharp knife and deeply score the top. (Make deep X’s) Use kitchen string to securely bind the roll crosswise at about 1-inch intervals. 4. Rub remaining olive oil over the roll then sprinkle with salt. 5. 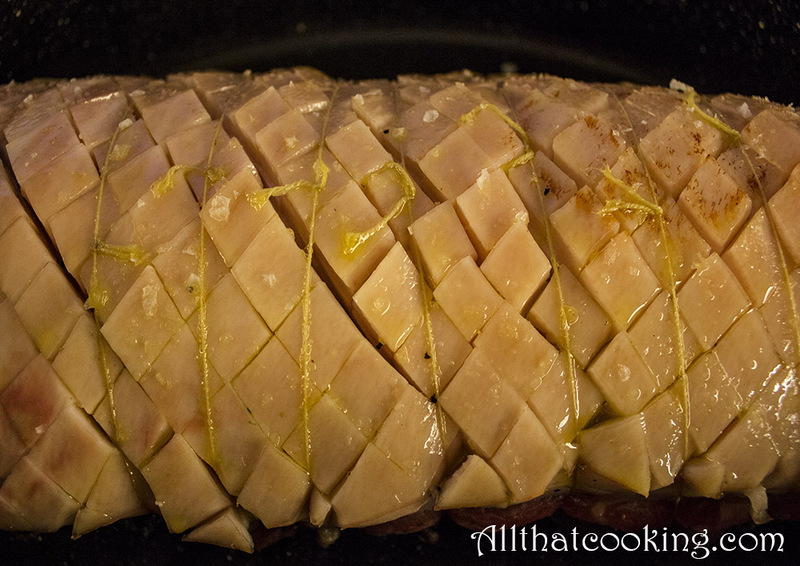 Place meat in roasting pan and put into preheated 350 F oven. Bake 1 hour and 45 minutes, or until temperature in the middle reads 170 degrees on a meat thermometer. Remove from oven and allow it to rest for about 20 minutes. Cut away the kitchen string, slice and serve. 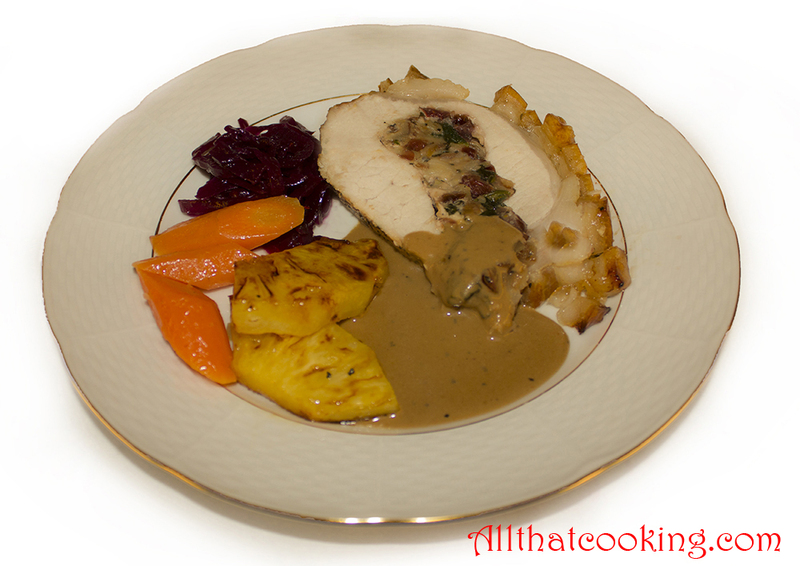 Oli served this on New Years Eve with carrots, red cabbage, sweet potatoes, caramelized pineapple and a cream of Dijon. But we think it’s a great anytime dinner as well. Gallery | This entry was posted in Main Dishes. Bookmark the permalink. But after all the festivitities Icelanders go to the fishmarket and i was forunate enough to be invited to a Turbot lunch (Sandhverfa) by my son and his wife in Grindavik. Turbot is a highly prized species (and often regarded as the best of the flat fish) with great flavour and firm, white flesh. It has an almost round shaped body, studded with bony tubercles on its dark side. Colour varies from light to dark brown, spotted with green or black and a white blind side. The Turbot is rather expensive but very popular in Europe and this is what we had for lunch.